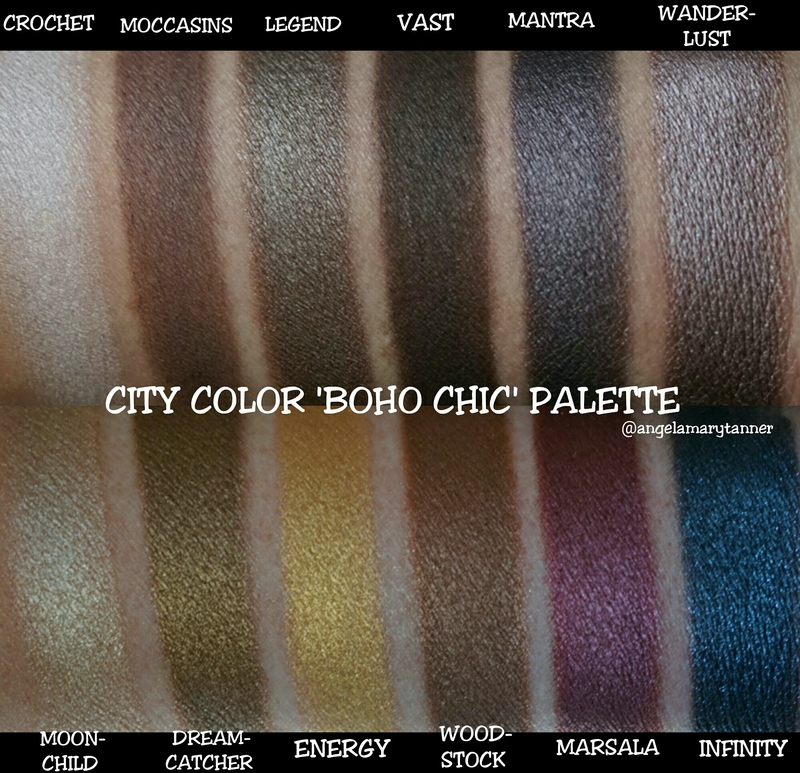 BOHO CHIC is my first palette from CITY COLOR. It’s a limited edition palette for fall and it retails for $15.99. It’s a slim cardboard palette with magnetic closure. Pretty standard packaging. It has 12 eyeshadows that are .053oz each. So you’re getting a good amount of product especially considering how inexpensive it is. The top row is mostly cool toned. Lot’s of taupes and smoky browns.The bottom row is more warm toned neutrals with a few pops of color. I like the overall color scheme and it’s mixture of tones. It’s versatile and will suit a lot of different complexions. There’s three different finishes in this palette: matte, satin and foiled metallic. The winners of the bunch are definitely the metallics. The satins are nice too. Actually the only color I had an issue with MOCCASIN. I found out it to be dry and lacking in pigmentation. The other two mattes, CROCHET (off white) and VAST (blackish brown) were more pigmented and easier to work with. The palette has four shadows that I’d describe as ‘foiled’. Meaning that they have a dense, creamy texture and larger pigment particles,kind of like a pressed pigment. Those four are WANDERLUST (purplish taupe), MOONCHILD (dark champagne), ENERGY (gold with copper undertones) and INFINITY (sapphire). I love this finish. I find it long lasting and easy to work with. The remaining five colors I’m going to call satin. Some of them are more shimmery than satin but they don’t have that super creamy texture that the other four have. LEGEND is a smoky taupe. MANTRA is a dark taupe that leans more purple than brown or gray. 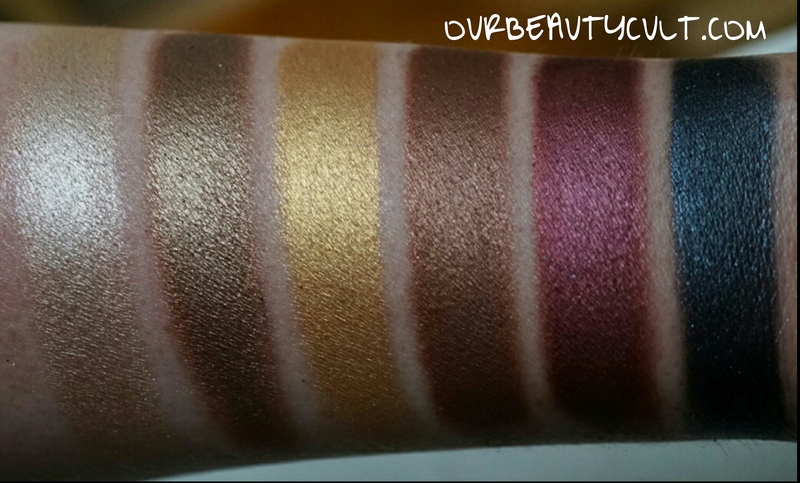 DREAMCATCHER is a warm bronze with a bit of an olive undertone, similar to UD SMOG. WOODSTOCK is reddish bronze with copper undertones. And my favorite color, MARSALA, a deep satiny cranberry. I’ve only used the palette once other than swatching it. The color pay off on the eyes was consistently good with the exception of MOCCASIN. Actually CROCHET didn’t have great pigmentation either but those matte cream shades rarely show up on me. 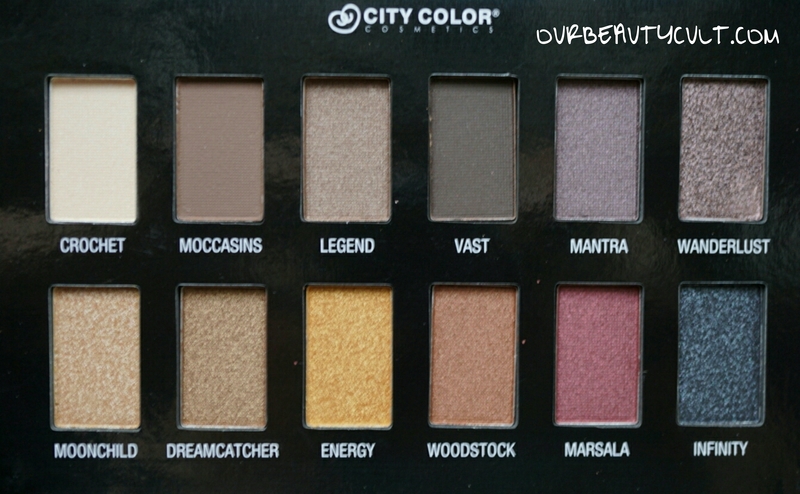 My only real issue with the palette is the lack of mattes. There’s only three and only one of them is good. For me, this palette is all about the shimmers. And you really can’t beat the price. I would recommend this palette because I like the color selection and I love the formula of the metallics. I’m not a fan of the mattes but I think the rest of the colors are well worth the $15 price tag! I’ve heard great things about their single shadows so if you guys are interested, I might pick some up to review!